The times they are a changing! Pound for pound, the Command Prompt is one of the most important features of the Windows operating system. And, until now, one of the most neglected. Luckily, the feature has been receiving some love from Microsoft lately. The company has been focused on bringing a number of UI and usability improvements to Command Prompt and move it away from plain and boring to something that is modern and colorful. 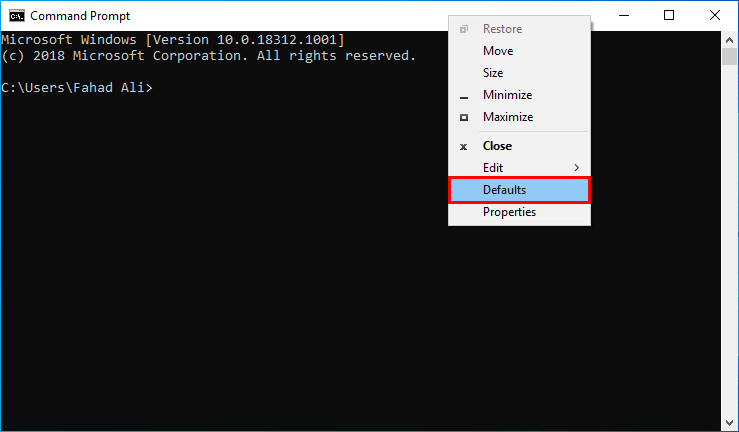 We’ll take a look at the various customization options now available for you to personalize the Command Prompt experience in Windows 10. Also known as cmd or cmd.exe, this is the command line interpreter in the OS, not dissimilar to the shell used in Unix based operating systems. The initial version of the Command Prompt was developed for Windows NT. But over the decades, this feature has only seen minor improvements. This is surprising, as alongside PowerShell and Windows Subsystem for Linux, this is one of the three terminal windows available in Windows 10. And widely used by power users and system administrators. Up until now, it has mostly sported the same black background and white text, which has been its default look since ye olden age. Even with the main Windows user interface going through multiple evolution over the years, the Command Prompt stuck with its inspired MS-DOS Prompt look — that white text on black background style of the 80s and 90s. But Microsoft has finally added a few options to customize different aspects of the experience. It is now possible to make the experience more personal by using different fonts, colors, and window layouts. Windows 10 even allows you to make the console semi-transparent. Custom color schemes to quickly change the appearance, or different looks for shortcuts means that you can start a new session with a different style that is suitable for the task you opened it for. You can also apply the settings globally, if you want. Command Prompt now has two distinct ways to customize its appearance, with each one affecting the console experience differently. These are available from the right-click context menu, and go as Defaults and Properties. Defaults: Any changes you make will not affect the current session, but Windows 10 will apply these new settings when launching Command Prompt using any shortcut. Properties: Customization made here will apply to both the current and future sessions. But only to the shortcut whose properties have been customized. This option comes in handy when you want to have different styles for different tasks. Let’s start with the what will probably be the first customization most of you will make. And one that will probably have the biggest impact on your Command Prompt usage experience. That of changing the font size and family used in the console. Search for Command Prompt, and click the top result to open it. Right-click the title bar and select the Defaults option from the popup menu. Under the Size section, select the size of the font that you want to use. The default choice is 16, but you can go as large as 72 pixels. As for the font itself, the appropriately titled Consolas font family is used by default. A handful other families that are suitable for use in Command Prompt are available, and you can make your choice from the selection offered. A nice little preview of the new configuration is available at the bottom, and any changes you make are reflected there to show how the console will look with the customization applied. It is also possible to revise the layout in Command Prompt to alter how much content is displayed. You have options to modify the screen buffer size, the window size, and window position. Follow the steps below to change these options. Search for and open Command Prompt. Right-click the title bar and select Defaults. The Screen Buffer Size section lets you specify how much content you can view and scroll while working in Command Prompt. The buffer size is based on grids, meaning the width is the number of character cells that can fit on each line, while height is the number of lines. These settings will not affect the size of the console, they only define the amount of content that you can view, depending on how large the width and size is. Clear the Wrap text output on resize option to adjust the width parameter. The Windows Size section lets you make the windows console larger or smaller. This is done by changing the width and height parameters that are, again, based on character cells, not pixels. And finally, you also have the power to launch Command Prompt in a particular position on your screen. In the Window Position section, clear the Let system position window option first, and then specify the new start position in the Left and Top These are specified in pixels. While you can usually modify most settings here without any issues, take care to only modify the screen buffer size if you have a reason. Time for some bursts of color. Want to make the commend line experience in Windows 10 a little less boring? You can change the text and background colors, as Microsoft has made a selection of customization available here. Open the Command Prompt console. Right-click the title bar, and select Defaults. Head on over to the Colors tab. You can change colors here by selecting elements from the left side and then choosing a color from the list. The window also provides RGB settings on the right that you can use to specify a specific color. Download any of the free color picking applications from the web to make up the color you want. Or simply search for “RGB color picker” on Google to get the values from the search engine’s built-in tool. Enter your chosen values, or make your choice from the colors available, and click OK.
Command Prompt will now change its colors to your chosen ones for the four option that were listed, namely Screen Text, Screen Background, Popup Text and Popup Background. How about a semi-transparent console window, just like Linux? Microsoft provides an option to bring the transparency down to a minimum of 30%. There are two ways go about this, one a dedicated setting in the panel, and another via use of the mouse wheel. Right-click on the title bar of the window, and choose Defaults. Click on Colors to go to that tab. You will find the Opacity section near the bottom. Drag the slider left or right to set the amount of transparency, and click OK.
Alternatively, you can also change the transparency for the current session without modifying the settings. The Ctrl + Shift + mouse wheel up and Ctrl + Shift + mouse wheel down combinations decreases and increases the transparency level, respectively. Making the Command Prompt translucent was one of the most demanded of features. It definitely comes handy in certain uses cases when you have multiple console windows open, and would rather have them stacked on top of one another with a transparent look. You can also change the size of the blinking curse on Command Prompt. Three options are provided here, and you can go with whatever looks best. Not much variety here, obviously, but this is merely a cosmetic change. Search for Command Prompt, then open the console. Right-click title bar, select the Defaults option from the popup menu. Select one of the available options for Cursor Size. Small is default, but you can also change your cursor size to medium and large by clicking on then respective radio button. Hit OK to get it done. This one is pretty straightforward. You can change the size of the pointer to whatever you are comfortable with. The ability to change the cursor altogether into something else would also be welcome here. It is also possible to customize the appearance of Command Prompt by using custom color schemes. This option became available with the Windows 10 Fall Creators Update (version 1709), though you will need to download a tool to use this feature. Download the Microsoft ColorTool from GitHub, extract the contents of the ColorTool.zip file, and follow the steps below. Navigate to the folder that contains the ColorTool executable and press Enter. You can do this by typing the cd C:\ColorTool command, replacing it with the path to where the folder you extracted the tool. Now, type the colortool -s command and press the Enter key to list the available color schemes. To change the Command Prompt color scheme, type colortool -b along with the name of the scheme that you want to use and press Enter. For example, you might want to opt for the OneHalfDark scheme, in which case you will type colortool -b OneHalfDark. When typing, be sure not to include the “.ini” or “itermcolors” extensions. The -b switch is optional, as it makes your chosen scheme the system default. That done, right-click the title bar and select the Properties option. Click the OK button to apply the scheme changes. Restart Command Prompt to start using the console with the new color scheme. You can revert to the original colors by using either the campbell or cmd-campbell scheme name in step 5. Customizing the appearance of the Command Prompt is finally a reality. Microsoft provides several options to accomplish that, and you can also download the tool listed above to completely alter the color scheme of the console to your liking. No reason at all to be stuck with the same black and white style if you regularly use Command Prompt in Windows 10.